For the love of, Darren Criss. Off the top of your head if you don't know who Darren Criss is, you better get up to speed. Over the course of the last couple years there are a few places you might have seen him. Recently he performed at the Capitol Fourth Celebration, that was shown on PBS, about a year ago he debuted on Broadway, playing J. Pierrepont Finch in How to Succeed in Business Without Really Trying. He is one of the creators and stars of Starkid, a musical theater production company, on television he plays the role of a very confident, gay character, Blaine Anderson on the hit show Glee. He has just finished his Listen Up Tour with Theo Katzman and Charlene Kaye(and guest performer Michelle Chamuel), hitting 16 cities in 33 days, he has a leading role in Girl Most Likely, a newly released movie, and is gearing up to host the Teen Choice Awards next week with Lucy Hale. For only being 26, he's got it all going on. He can act, sing(like an angel), he's funny and for the icing on the cake, he is incredibly cute! What's not to love about him? He is such an inspiration to so many people. For him, in Glee, he is a straight man playing a gay character. To me, for him to do that it shows that he is confident and comfortable with himself, not only as the actor but his character, Blaine, also, who is an amazing example for anyone. He embraces what makes him him and is not afraid of showing it. Something many of teens have a hard time with. I will admit, I have a huge crush on him. I would die to meet him, which has not happened yet but I was lucky enough to see a concert this summer. It was incredible. I honestly don't know how he does it, I saw one of his last shows at the Boston House of Blues(awesome place to go, btw) and yet he had so much energy! He had a show in a different place almost every night and he was giving everything he had into that show. Every single person in that place was into it. Just little things he said and did really turned the show into something I will never forget. Multiple times he referred back to saying something like "if you have no idea who I am and are here because you are being made to, I am Darren and love making music for you guys". As if any of the hundreds of screaming girls who had been waiting in line for hours didn't know who he was. 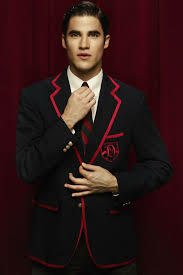 His performance of Teenage Dream(originally by Katy Perry but for anyone who has seen Glee knows that is pretty much his default), literally took your breath away. It was the best song I have ever heard performed live. There was so much energy in the room, so much sound, so much emotion, it was simply amazing. One part to the show, which I had never seen before was that he started and ended his concert singing The Circle of Life. In the beginning you didn't even realize that's what it was, you just kept hearing sounds and rhythms as the members one by one came onto stage. It really took a few minutes to really put it all together, then he started singing and you really knew what it was. What we didn't know was that this was all foreshadowing the end. After hours of entertainment you realized that at the end of what we all thought was his last song, actually was resolving into the final phrases of The Circle of Life, in which he hadn't sang in the beginning. Ending the show with us being able to do nothing but look over at the person next to you and say, "wow". I will assure you, whether you are young or old, girl or boy, you will not be disappointed after one of his shows! Even my brother, who tries to make me believe he is not into the same music I am, couldn't keep to himself how impressed he was. He really should be on your bucket list. And I am sure he will only get better. 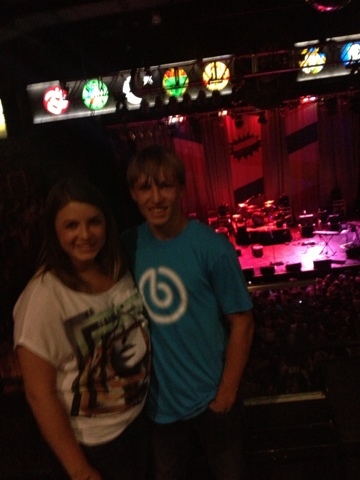 My brother and I in the mezzanine waiting for it to start. The girl that took this picture should clearly not be a photographer.. 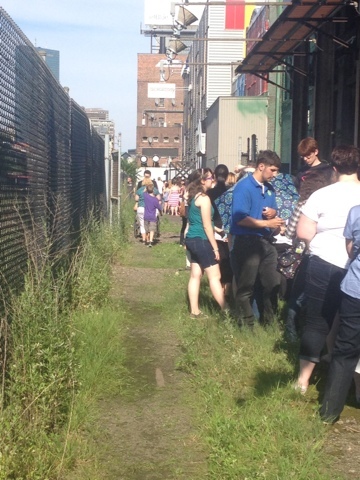 This is the line we waited in - it went all the way down the front of the building, around the side and down the back! And, we were not even close to the end!! 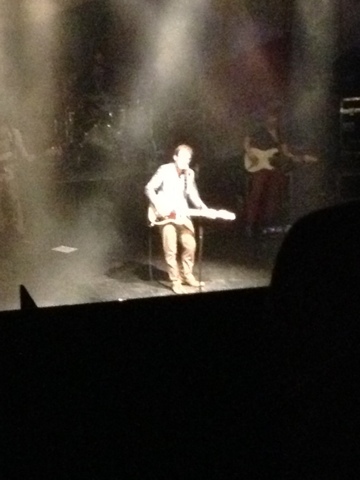 Theo Katzman - come to find out he was also the drummer for Darren Criss. Very talented and incredibly funny! 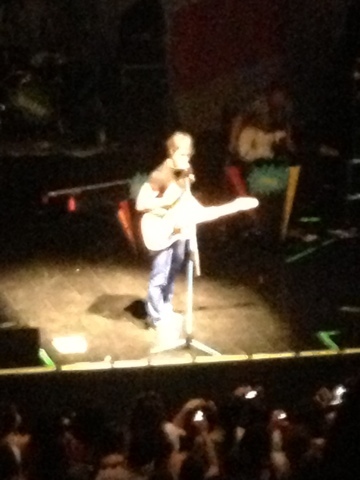 Just one of the not-so-good pictures I took of him with my phone. Most of the time museums are not my ideal idea of a fun time, but that was not the attitude I had when heading to the Metropolitan Museum. 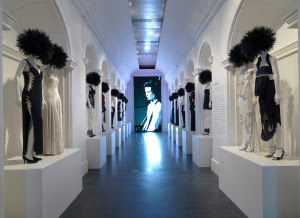 The recent "Punk Chaos to Couture" exhibit was the attraction us fashionistas at the FIT Pre-College program yearned for. I really had no idea what to expect. Hope for the best but only expect the worst, I guess. It was going to be my first time at the museum and not only that but personally I am not really into "punk", so I wasn't really sure what it was all going to entail. As taking my first few steps into the exhibit, I was in awe. It was breath taking in a way hard to explain. It wasn't that the there was beautiful artwork on the walls, that's not exactly what I would call it. It was the loud cutting edge music, the abrupt sudden movements in the video and the dark setting throughout the whole thing, that gave me a feeling like no other. All of this together put me in the mindset of what it could have been like living in that revolt. I pictured myself walking down and alley in the city lined with graffiti and people that lived to be different. It was almost overwhelming but it fit the exhibit to a tee. The exhibit started off with a few blurbs to read and just a few models, setting us up for what was to come. What really caught my attention though was the little display of what showed a bathroom that had been completely vandalized and soiled. This was exactly what the punks were. They were outcasts in society that wanted to pretty much do the opposite of expected. If the public bathroom was to stay clean, they would dirty it. If it was absurd to wear racist or suggestive graphics.. you're right, they would do it. The exhibit showed examples of clothing that they wore during this time. Some of it was actually hard to look at. Many images and quotes that would be completely repulsive this day in age. But all of this lead up to what was coming, it was all just around the next corner. Dozens of couture dresses lined the hallways, all having that punk edge. 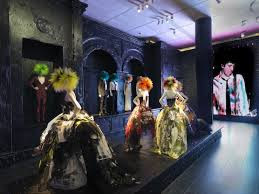 Over the last about 20 years, designers like Alexander McQueen, Calvin Klein and Dolce & Gobbana have used their own interpretations of the punk time period in their creations. These are designers that would not necessarily cross your mind when thinking of punk, but they have all used it in their own way. You could really tell in each of the pieces if they were done by the same person, there were usually a few outfits that had the same main idea. Many the same color scheme or made by the same materials. Showing that they all had come from the same collection. The theme mostly throughout all of them was the recycled aspect of each. Some being dresses made of garbage bags, or ripped apart shirts put back together with a hundred safety pins. A big part of it all was the do-it-yourself option for most of the outfits. It made everything very unique and made it as though it was not so out of the ordinary. All though this style is not for me, at all, I highly respect it for shaping the industry today. I was incredibly fortunate to be able to actually see the exhibit, it really gave me a point of view to fashion I didn't have. I would say that for me, seeing it once was enough though. I would recommend it to anyone that could stop by, it really was a sight to see.